Original Crime Scenes still look just as good 20 years later, and we had to stay authentic to the quality and style fans expect from us. Due to intense fan demand, JNCO is excited to announce the official return of Crime Scene wide-legged jeans. Along with iconic designs like Mammoths, Kangaroos, and Rhinos, Crime Scene jeans with 50” leg openings helped make JNCO a beloved streetwear brand in the 90s. 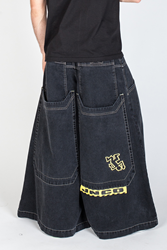 Following JNCO’s 2015 revival, diehard fans expressed their intense nostalgia for Crime Scenes due to their unique design, high-quality materials, and comfortable fit. JNCO listened to the fans and Crime Scene denim jeans are now available for purchase online at JNCO.com. Exclusive access at other retailers will be announced later in 2016. As with other iconic designs in the heritage line, Crime Scenes are yet another well-made yet price conscious denim product from JNCO. The 50” leg openings re-evoke the styles that made jaws drop back in the 1990s, and this loose, comfortable style has been given new life in 2016. Also added to the JNCO product line is the Crime Scene Tee, which adds a modern streetwear twist to the classic Crime Scene jeans. Stay tuned for other heritage wide-legged jeans, baggy pants, loose shorts, hoodies, and T-shirts to be announced in the coming months, plus modern designs added to the JNCO product line.